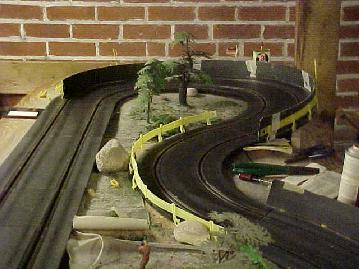 This section is dedicated to the setup of the track and cars. 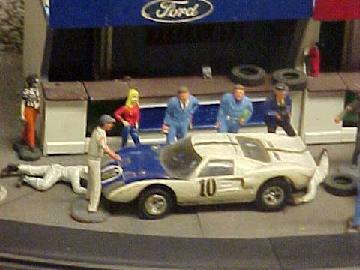 In the future, photos showing the stages of assembly of track and cars will be included. Strombecker was the manufacturer of the track and cars, but is sadly out of business. We currently are not looking for parts, but in the future may be searching via online auction for chassis, hard shells, motors, gears or track. 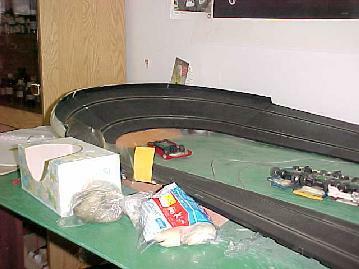 Tracks are assembled from 5 basic pieces - a 12" straight, a 6" straight, a 60 degree turn, a 30 degree turn, and 60 degree banked "Monza" curves. Each layout is as close as possible to the drawings you've seen in the Tracks section, but the drawings are a representation of the actual layout and in fact had to be adjusted to appear correct. (See if you can find the fudge in each track drawing!) The true layout is described in the text box. Green is straight, purple is the 60 degree turn, red is 30, and black is Monza. 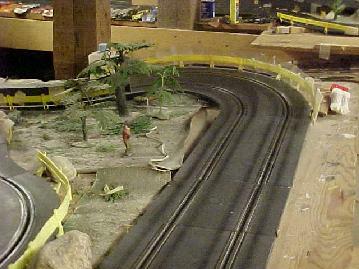 Tracks are laid out on purpose-built tables, set for maximum visibility and ease of access. Traill is approximately waist-high, while Donaghadee's levels are at about the 2001 strike zone edges (letters and knees). 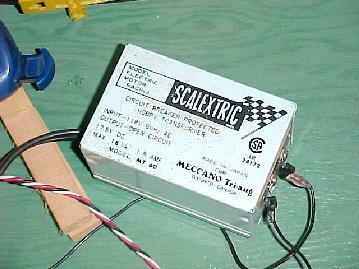 Power is provided by a 18V DC transformer at Traill, and an 17.5V (?) Scalextric transformer at Donaghadee. 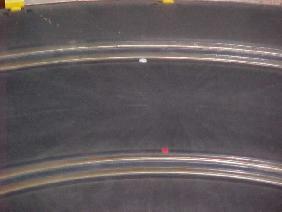 The track has the power rails periodically exposed on the bottom of each track section. The assembly of these circuits has taken advantage of that by running additional wiring directly to various sections of the track, to ensure that even circuit sections remote from the power supply have a reliable connection to the power. As may be imagined, it becomes difficult to tell which track the driver is using when a corner marshall has to put the car back on after a crash. To that end, each track is numbered "Track 1" and "Track 2" and the controllers and track are colour coded. Thus, when a driver's car must be put back on the track, it is a simple task to check that the car is put in the correct slot. The final notable modification is in the area of guardrails. It was found that cars with the soft shells as detailed below would often have their tails get hooked on the low plastic rail as made by Strombecker. The rails thus had to be raised so that the cars could properly lean into the corner and not get stuck. 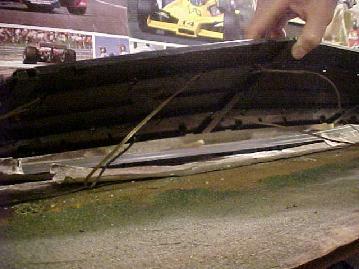 Where visibility of the car is an issue, clear plastic was used to line the rail and raise the effective top of rail. In locations where visibility was not an issue,, stiff cardstock cardboard was used instead, as it was found to be more durable. 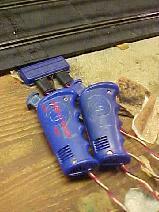 Most of our cars have had the wires soldered directly to the braids, and quite a few have had the original wires completely replaced with heavier-gauge wire. The hard shell above is an example of the stock Strombecker shell. 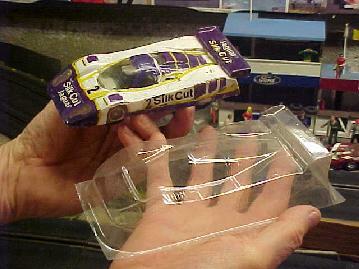 Below are examples of the clear, light plastic shell that replaces the stock shell. The shells are cut to shape and, after painting, are fastened to the inner portion of an old hard shell that contains the posts that mount to the chassis. Often the old car's driver is mounted on this part of the old shell. For sake of clarity, this partial hard shell will be called the mounting platform. As can be seen in the above photo, the chassis has three openings that connect to posts (not visible) on the mounting platform. Pins (the blue dot in one of the posts) can be added to fasten the chassis to the platform. They're generally a pain to remove when the car needs repairs, so each car is usually only given one. (They're also scarce.) Often the pin is put in the post immediately behind the braid shoe, as this fixes the front wheels so that the wheelbase is set at one of two lengths. Longer wheelbases are better for the performance of cars with longer shells, like the Alpine A442, while the Can-Am cars in general handle well with shorter wheelbases. 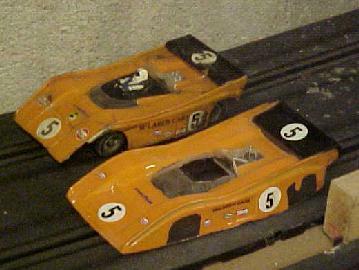 The McLaren M8F has been a popular car over time, and the shell is very close to the end. The shell is going to be replaced with the longer M20, as shown above. Note the driver in the M8F (Denny Hulme) - this is part of the lightweight shell's construction as well. Most mounting frames have the original driver removed and the new one added, as the closed roof vehicles often cannot accommodate the height of the original driver's head. There is one car, the Shadow DN4, which could not be mounted on a platform without raising the shell to the point that the vehicle would be unrecognizable. 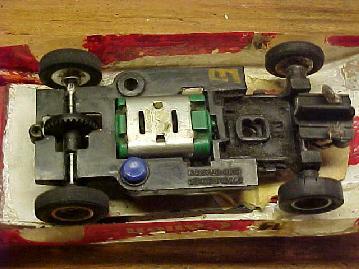 This model was jerry-rigged by direct taping of the chassis to the shell. Naturally, maintenance is a nightmare. It should be noted that some actual vehicles' shapes are not very well-represented by the front of the model. The necessity of accommodating the model chassis front end's height required that the shell makers change the aerodynamics of the front. Good examples of this would be the Renault A442 and the Porsche 956. See the car section for photos of our cars and the originals. More photos of specific parts, and other slight modifications, will come in time. Axle adjustments, tire adjustments, and braid adjustments will be discussed once photos are available.